The Microsoft New Phonetic IME, developed in Taiwan. This is the most common choice. Unlike the PRC IME, this one allows you to enter tone numbers after syllables (as in "pin1yin1") or not ("pinyin"). 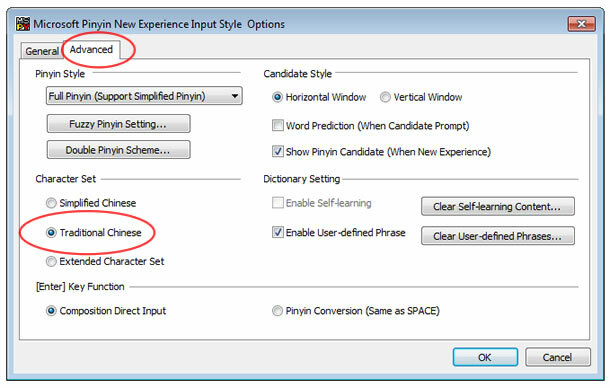 To use the Microsoft New Phonetic IME as your Pinyin input method for Traditional characters, you first select it and then set the input preferences for Pinyin. Click on the Windows Start menu button, then click "Control Panel". 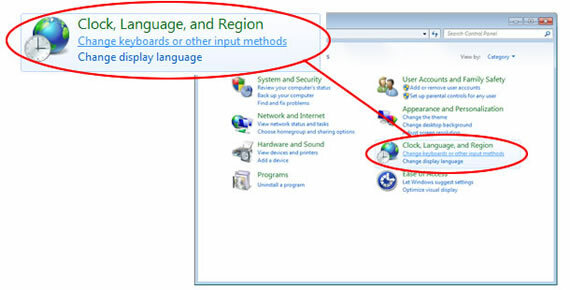 Then, in Control Panel find "Clock, Language and Region". 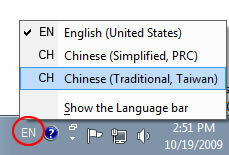 In Windows Vista, scroll down to "Chinese (Taiwan)". In Windows 7, this is "Chinese (Traditional, Taiwan)". Click on the plus sign there and next to "Keyboard". 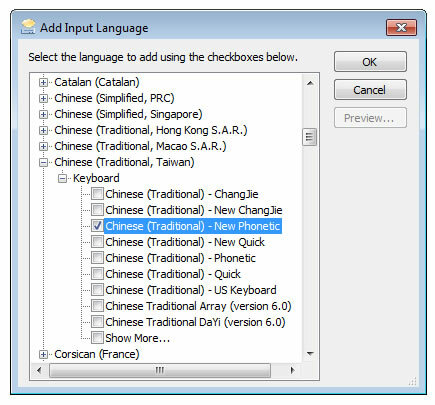 Click the checkbox to select "Chinese (Traditional) - New Phonetic". You may also select other input methods if you are familiar with them. 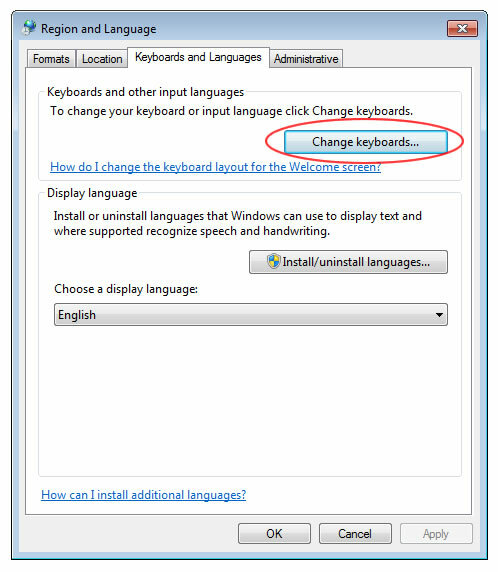 After you install the 2010 update for this IME, New Phonetic and other input methods will be labled "2010", and under Hong Kong you will find Cantonese Jyutping input. Click the "OK" button here and then click "OK" in Region and Language as well. 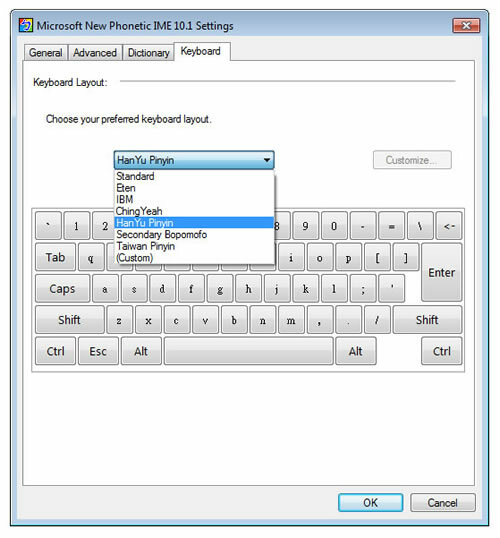 In the pull-down menu under "Choose your preferred keyboard layout", select "HanYu Pinyin"
Click OK, and then click OK in "Text Services..." and click OK again in Region and Languages. FAQ: How do I enter the letter "ü" ("u" with an umlaut, the two dots above the letter)? FAQ: How do I get the "candidate list" to appear in the Windows Taiwan (Traditional) IME? FAQ: The characters in the Windows Taiwan/Traditional candidate list are really tiny! Is there a way to adjust the size of the text in this window? 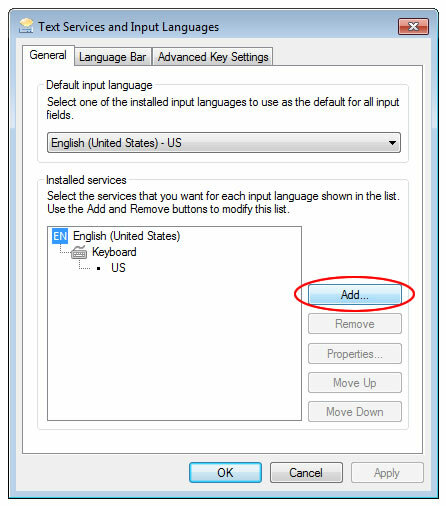 HELP: English-language user guide for the Microsoft Chinese Input Methods. 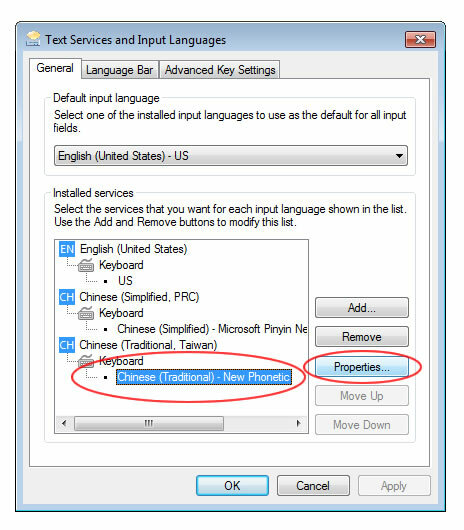 Microsoft Pinyin supports Traditional! if you haven't done so already, first return to step #1 and set up the PRC IME for Simplified characters. Then look at your task bar. If the 简 / 繁 / 大 button shown above does not appear in the Taskbar, look in the little menu at the far right of the language band (the one marked by two windows / rectangles, next to the Help("?") menu. After selecting this option once, it should move to the taskbar. If it's still not there, install the MSPY 2010 update. You can also get this started and find more preferences via the Options menu, as I'll show below. But first, a bit of information for you. For those of you that exchange Traditional character messages with people in the mainland, using this feature this a good idea because mixed encoding eventually causes emails to get scrambled. But for everyone else, the fact that this PRC input method will default to PRC GB font encoding instead of Big 5 even when writing Traditional characters will be what we call in business a "deal-killer". When Windows Vista was released, I was very excited with Microsoft Pinyin (MSPY) version 10, because it included support for Traditional characters. However, when I wrote up the instructions I found myself listing far too many disadvantages to recommend it. Most important, in Traditional Chinese mode it does not support "Self-learning" (sorting character and phrase candidates according to your frequency of usage). Notice that in this slice of an Options window screen shot below, "Enable Self-learning" is grayed out. For me, this is a deal-killer! The accuracy of a Pinyin input method depends heavily on the characters automatically sorting as you use it. I've also tested the third choice, "Extended Character Set". This contains both Simplified and Traditional and does support Self-learning, but getting this to favor Traditional characters requires many many hours of training and user-defined phrase dictionary editing, and even then it will probably mix the two sets together far too often to allow fast and convenient typing if you are trying to use only Traditional Chinese. There are times when the system gets confused, especially when you are also working in Simplified characters: it starts out in a Simplified font anyway, and won't let you change that line to a Traditional font. For many people the easiest solution is to erase the entire line or even open a new document and start over. (This has also happened to me when switching between "Chinese (PRC)" and "Chinese (Taiwan)", so I probably shouldn't blame "Chinese (PRC)" for this alone. As I mentioned above, you will be working only in GB encoding fonts, not Big 5. But as I said, this is not a drawback for anyone who exchanges Traditional character messages with people in the mainland, because mixed encoding eventually causes emails to get scrambled. On the other hand, if you try using this MSPY feature while writing to people in Taiwan, you run the risk of your messages turning into a bunch of garbage characters with no way to recover the original content. 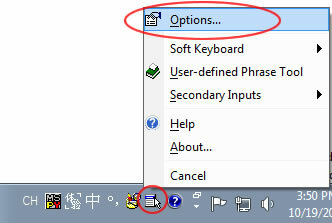 Click the Options menu icon and then in the menu click "Options..."
If the "Traditional Chinese" option is grayed out, try installing the 2010 update for Windows XP/Vista/7, or reinstalling the Windows 8 IME (which also fixes the problem of not having Simplified in the Win 8 Taiwan/Traditional IME, so that's why this last link leads to an FAQ page on that topic).